Corporate events are very important dates in the company calendar. These events come around quickly and a lot of planning is involved in making sure the event goes to plan! Ace Star limousines provide limo hire for Corporate Events like the entertaining of clients, staff incentives, Christmas parties, summer race days, theatre outings, golf days, tickets to sporting events and so on. Arranging the transport for the corporate event is a big part, this is where we can help with Corporate Limo Hire. Ace Star Limousines provide corporate limo hire for companies to transport their staff or clients to add that wow factor to any event. Hiring a limousines is a must have addition to your corporate day. The only hard decision you will have is when you see our fleet of limos, we have the stunning Audi Q7 limo in white, the Baby Bentley limo in white, the BMW X5 limo in Black and the Hummer limo in a two tone colour all available for your Corporate limo hire needs. Each limousine can transport a minimum of eight passengers at any one time, rising to a maximum of 16 passengers in the Hummer Limo. Also most people love limos when they’re going out to enjoy themselves because a stretched limo can be a great way to get to know your work colleagues more as your all in the same vehicle at the same time. Our limos have beautifully lit ceilings bars inside with music for everybody, disco lights, DVD players. We can provide you with a package to accommodate all your needs, we can provide additional limo hire at cheap rates and we also do return journeys for corporate limo hire events. The popular corporate limo hire events include day’s outs at the races, christmas party limo hire, work leaving do limo hire and many more. 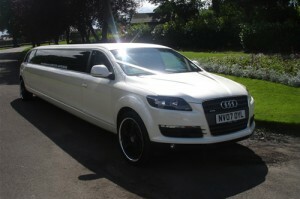 What ever your requirements Ace Star Limousines are able to provide!